Utilising our comprehensive gear manufacturing facilities, we offer gear cutting, gear induction hardening and gear grinding services to the market. 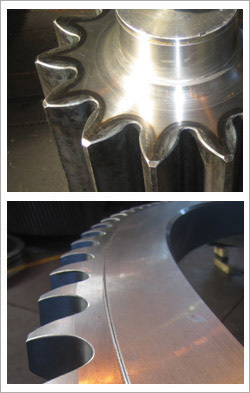 We provide both external and internal gear cutting services, for all pinions, main gears and / or girth gear requirements. Our large diameter gear hobber can accommodate a max. 7 m in diameter. With our gear grinding facility we can supply gears of the highest quality according to DIN or AGMA standards. applications or antennae positioning applications. Utilising our large capacity CNC milling and drilling facilities, we can manufacture a variety of sprocket configurations, including simplex & duplex sprockets to a maximum of 3,500mm outside diameter. Sprocket tooth profile can be induction hardened to provide extended service life.